I’m slightly tempted to take that face and put it on every movie poster I can find. It would work great with romcoms. Where they’re both the same face. Or one of them is Cyril. 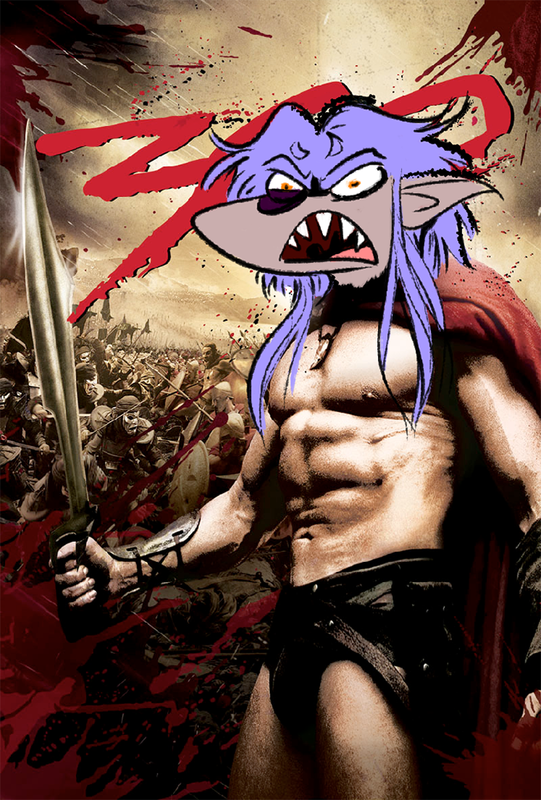 I’d watch 300 if it was about sharkmen! Happy 300th! I love how he holds his cape up like it’s a dress or something. Can’t get that wet, can we? Is it dry-clean only? While we’re throwing things at Cyril, why not throw the bottles? They’d totally break against his dense head. Poor bard. Did he REALLY think hanging out with a villain would be easy, or a good idea? CONGRATULATION COURTNEY!!! I’m so happy for you! Celebrate it by chucking shovels at the bard! … Honestly, I think that I might like 300 better if it were actually about sharkmen, or set in Idenau. Yeah, I thought that movie was awesome when I was like, 15, and “Whooa! SLO-MO! BLOOD SPATTERS! DARK AND GRITTY! I’m so mature, I can handle all this!” But now… eh. It has most value in how over-the-top it was. Kicking people into pits is apparently what they did in Sparta. 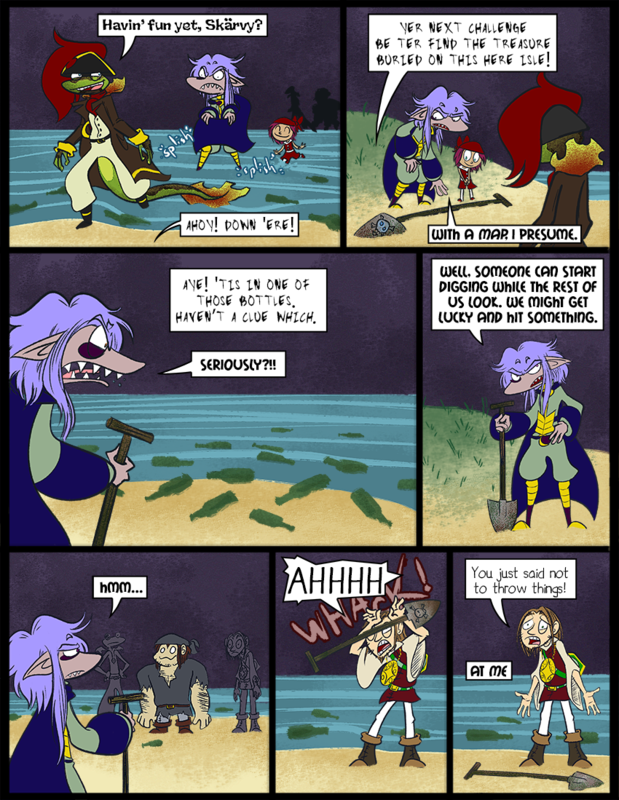 Well, I kind of already have: http://sharkman-land.tumblr.com/post/72466847949/art-retrospective-2013 but only for this past year. Admittedly, It would be even more impressive if I went farther back. where did you dine tonight? A very very warm place. Surprised I’m the first to say it, but there’s a reason it won’t work on any movie. But for this. This! Or maybe Blank kicks a door into a pit. In hell. BECAUSE THE BARD WAS THERE. Oh Cyril, you poor little punching bag. You’re really rocking the six pack and armor-undies, Skärva. I lost it at “armor-undies” for a solid minute. Bravo, Jello. Heheh, well, I am pretty great. I wonder if Skärva would put that poster up in his castle. Like the one Lord Hater has. I had a spit take at those last panels…. He got lucky and hit something! Laughed hard at Cyril’s quote in the last panel. Just the way I imagined the whiny voice. I would totally start smashing the bottles with the shovel, that’ll learn ’em. A whole three hundred, eh? That’s a lot o’ comics. Almost a third of the way to the big quadruple digits. Here’s to a long and prosperous road ahead of you! Gotta say, Skärva’s calves look much better. Also, the different drawing style makes everything look a bit more… Rustic? It really is subtle, in a good way. I wonder how many pages this comic is destined to have. Maybe two thousand. I have no idea. All I know is we have a LOT of ground left to cover. We haven’t even gotten to the part where *SPOILERS* and then *SPOILERS* spends the rest of the story *SPOILERING*! It’s a long journey but just imagine how good my art will be at the end of it! Yay for no more deformed calves! I’m glad you like the new style!